This post is brought to you by the letter N.
I love necklaces and wear one nearly every day. My current favorite is a silver key necklace my mom gave me when she was in town shortly after my birthday the other month. Apparently key necklaces are very in now. So besides being pretty, what's the deal? The basic idea is that keys open doors. Ok, we all knew that. 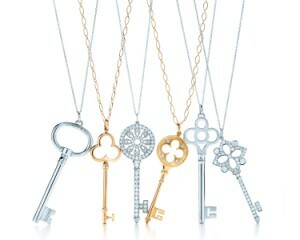 Probably none of these stylish key necklaces open anything, but the point is that they symbolize access. Doors open for you. Wardrobe doors to a magical land with talking animals. Or a cupboard that turns plastic figures into real little people. Well, that's what I'd want my key necklace to open. But I guess it's a nice gift to give people who are at changing points in their lives to either reassure them that when one door closes another door opens, or to wish they have many opportunities. Choose-your-own-symbolism, like. Or just that it's pretty. And of course it's a big deal because there's a Tiffany's key collection (with price tags ranging from $275 - $8,100) to drool over. No worries, you can get much cheaper (and still quite pretty) key necklaces. Do you have a key necklace? What do you think of this trend? Would you gift a key necklace?